Taking that fine old car into the 21st century was never going to be easy, though, and there were a number of changes in direction along the way. 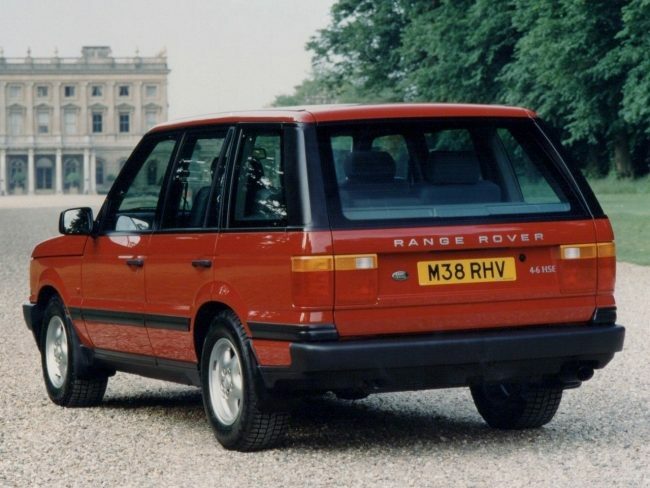 By the mid-to-late-1980s, the Range Rover’s transformation into a luxury express was well underway; one only had to look at the success of the Vogue editions of it to see this. Cannily, Land Rover tapped into the healthy demand for increasingly plush versions of the Range Rover, and ensured that prices remained relatively high, but not hideously so. This pricing policy ensured that the Range Rover would always remain relatively exclusive, but accessible enough for aspirational customers to feel they could reach one. With this, the future for the Range Rover brand was set. With the lower-priced Discovery under development, the intention was to push the original (and best) increasingly upmarket, ensuring that the Range Rover would represent the absolute pinnacle of four-wheel-drive vehicles. In the long-term, planners knew that the original 1970 Range Rover (known later as the Range Rover Classic) – as smart as it was – would need significant development to keep pace the development of rival cars. Work began on the project in 1988, with engineering and styling work being focused upon – but no deadline for launch was set. 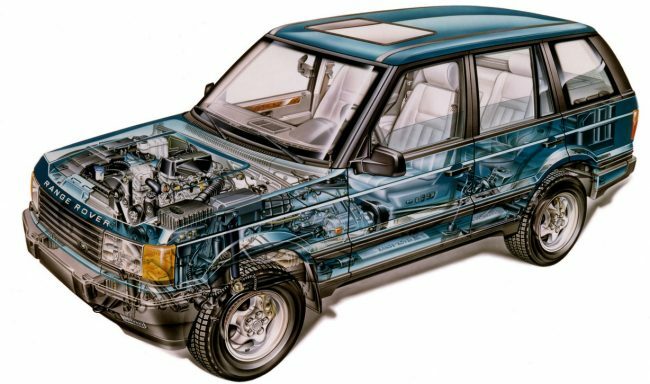 It was not until 1990, and with a budget of £300 million, that the project to replace the Range Rover was formally started under the codename of 38A. The launch date of late 1994 was set at this time. Technically, meeting the demands of the 1990s would be no mean task but, given the excellence of the original, a firm foundation was already in place. Also, because of the relationship between old and new, it would be entirely possible to introduce features bound for the new car into the existing one. It was a ploy that had worked well in the past for Jaguar and Rolls-Royce so, in this respect, the Range Rover was in good company. However, of more concern, was the new car’s styling. Rather like the difficulties encountered by Porsche when it came to replacing the 911, Land Rover knew that a major part of the Range Rover’s appeal was its styling – and it would need to be absolutely right. A great deal of care and attention would therefore need to be employed in the development of the 38A’s look… it would need to look substantially more modern, yet be readily identifiable as a Range Rover. The first challenge: modern or retro? Thomson needed to weigh-up the conflicting stylistic demands of the new project, stating, ‘We had to produce a familiar, yet contemporary design that would delight existing customers and attract new luxury car lovers.’ It seemed that there was no shortage of styling houses that were keen to undertake the task and, with the help of Pininfarina, Italdesign, Bertone and British designers John Hefferman and Ken Greenley, Thomson’s team produced five separate models, which all sat on the upcoming LSE chassis with the longer 108-inch wheelbase. There was quite a range of designs, from the evolutionary in-house effort, to an advanced Renault Espace-aping one-box. Ultimately, only the Bertone and in-house efforts were developed into full-size models, and it was at this point that market research and customer clinics were set-up to find out which would be the more suitable design. In one French clinic, which would eventually prove pivotal to the project, it became clear that the Bertone design just was not ‘Range Rover’ enough. The truth is that on this occasion, as on so many others, being led by customer clinic results led to a rather conservative car. It has to be said that the result was handsome, and it did grow on people – just as Land Rover promised it would – but it was not a leap forward in any respect. 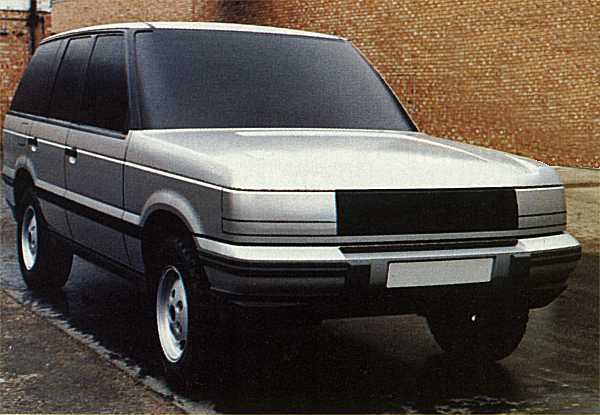 With the Pegasus styling scheme chosen, it was a simple task to transpose strong and traditional Range Rover styling cues onto it, to maintain that family resemblance so desired by the management. These cues were identified as a low waistline, straight flank feature-lines, dark window surrounds, floating roof and ‘castle’ ridges on the front corners of the clamshell bonnet. This was a successful ploy – and anyone from 100 metres could tell it was a Range Rover. However, one disappointing aspect was the deletion of round headlamps in favour of large, rectangular items that looked out-of-place on an expensive car, planned for the 1990s. In fact, they looked to be standard Euro-issue items from 1980 and give the front end of the car a look distinctly reminiscent of the Talbot Horizon. Wind tunnel testing successfully improved the original’s brick-like aerodynamics from a cd of 0.45 to an acceptable 0.38. This was achieved by subtly altering the rake of the grille, paying close attention to the glazing and adding small strakes on to the rear pillars. What lay under the Range Rover’s skin? In terms of body and chassis engineering, the P38A (an amalgamation of ‘Pegasus’ and ’38A’) retained much of the original’s underpinnings. The ingredients were familiar: a ladder-frame chassis (stiffened by 18%) with the body compliantly mounted in the interests of NVH (noise, vibration, harshness) reduction. Crashworthiness was also improved, with front and offset impact resistance improved with further chassis reinforcement. The fuel tank was also re-located to beneath the rear seat, and side impact bars were added to all the doors – all in the interests of improved safety. All of the engines were new: two versions of the Rover V8 were introduced, in 4.0- and 4.6-litre forms. Somewhat rather like Trigger’s Broom that had several new heads and handles, the venerable and constantly developed V8 continued. The 4.0-litre version developed 190bhp and 236lb ft torque, while the 4.6 developed 225bhp and 277lb ft torque. For the P38A, it was decided to look for a replacement diesel, as the old VM power unit would not cut the mustard in the larger car. Programme Director, John Hall’s search for a replacement diesel engine took him to six manufacturers including BMW. 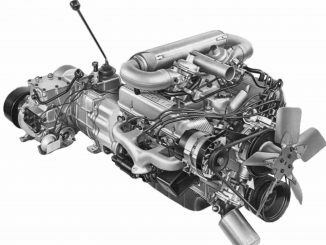 ‘I don’t think BMW realised what they had,’ Hall recalled, ‘It’s probably because the majority of the organisation was sporty petrol-engine orientated that the diesel engine is so bloody good.’ A deal was brokered, and Land Rover gained the right to use the straight-six turbo diesel – some tinkering to the ECU was made to give it a more favourable torque curve. As befitting an entirely new car, the interior was completely overhauled as well – finally putting to rest the 1970 vintage dashboard architecture. The heating controls were simplified, and the adjustable ride-height controls were now totally intuitive. 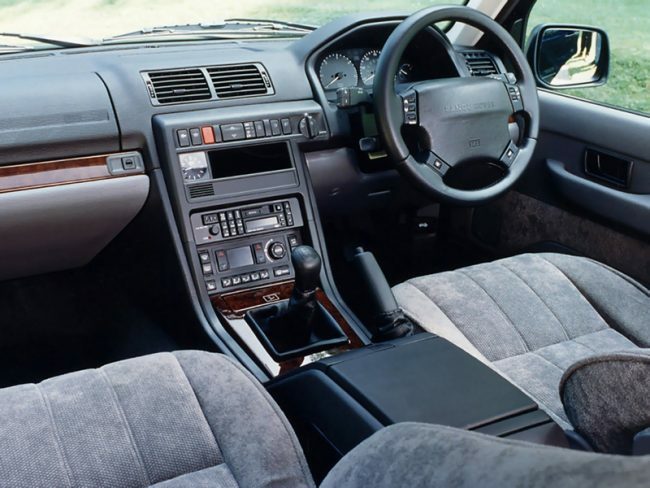 The aim of the P38A programme was to improve interior quality, and bring it up to Germanic standards, as befitting the car’s upmarket role. Certainly, these goals were largely met, although designed-in quality still had a little way to go – put that down to the none-too-generous development budget. Was the quality as good as the opposition? That would all become clear in the ensuing years. And that hit the nail on the head. 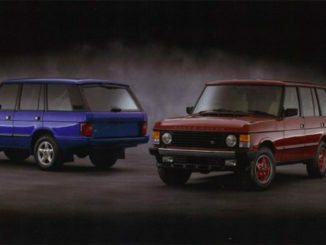 The new Range Rover was undoubtedly a thorough makeover of the original, it did not move on the game nearly far enough. It should have done – the P38A was conceived with and ran on air suspension, which offered different driving modes, as well as an adjustable ride height. In 1994, this should have been a game changer. By the time the P38A went on sale, Land Rover was fully under BMW’s control. As early as 1995, plans for the 1998 mid-life facelift were taking shape. The idea was to update the styling, and kill off the old Rover-based V8 engines, replacing them with all-new BMW units. The plan was to use BMW’s 3.5- and 4.4-litre V8 petrols and the company’s 3.0-litre diesel would supersede the existing 2.5-litre BMW unit. The man in charge of Land Rover, Wolfgang Reitzle, clearly saw the car’s potential as a super-expensive luxury car and, as such, commissioned the potential upward stretch of the model. His idea was to fit parent company’s BMW’s 5.4-litre V12 under the bonnet of a range-topping model to creating the first £100,000+ version of the car. As Hilton Holloway recalled in 2013, ‘the bigger engine demanded a much longer (around six inches) front overhang which could have compromised the car’s off-road ability.’ Two running prototypes were built. But Reitzle was unhappy with the quality of the car, and famously pulled it to pieces after sitting inside an example at Gaydon while wearing a blindfold. His touch test created a list of 70 issues that needed rectifying – and that was just inside – which led to the P38A’s comparatively short production run. That’s because Reitzle pulled forward the replacement L322 programme ahead of the Discovery 4 to create a range-topping car with quality that was worthy of its market position, and the 1998 facelift was watered down to incorporate mild cosmetic improvements and allow the improved ‘Thor’ versions of the Rover V8 to be used. The march upmarket for the Range Rover begin in earnest a year after the P38A’s launch. 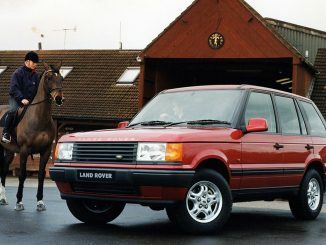 The 1995 London Motor Show saw the launch of the Land Rover Autobiography programme extended to the Range Rover P38A. You could add bespoke luxury features to either a 4.0 SE automatic or 4.6 HSE. Inside, leather seats were offered in a choice of Standard/Modern or Traditional facings, while there were no fixed exterior colours. Additional wood and leather also upgraded the interior, and served to underline how complex and time-consuming building these bespoke cars, as it involved utilising the specialist services of a number of external contractors. Following completion of its assembly, each Range Rover Autobiography was then transferred to the LRSV operation. At LSRV, each Autobiography P38A was carefully stripped of its removable body panels such as the doors, front wings, bonnet and tailgate sections in readiness for its hand-finished re-paint in the non-standard colour specified by the customer. 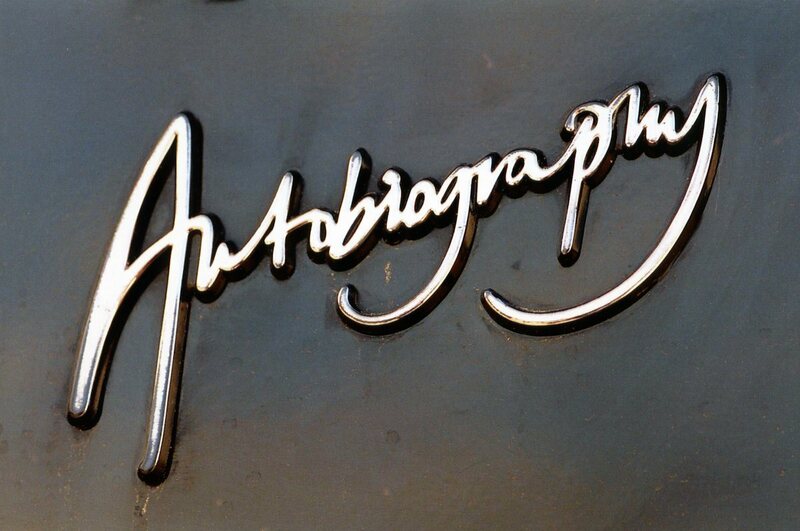 In 1996, the Autobiography programme was extended to include cutting-edge ICE. For the first time in an official Range Rover, you could get a television and video system with VHS player. This comprised of a TV screen in the back of each front seat head restraint and infra-red remote headphones to listen through. In addition, you could specify Philips CARiN satellite navigation system which would become available from Spring 1997. To assist in the launch of this new feature and the other enhancements in the Autobiography programme, Land Rover enlisted the services of TV personality and long-standing Range Rover customer, Noel Edmonds, who made a special appearance on Press Day. 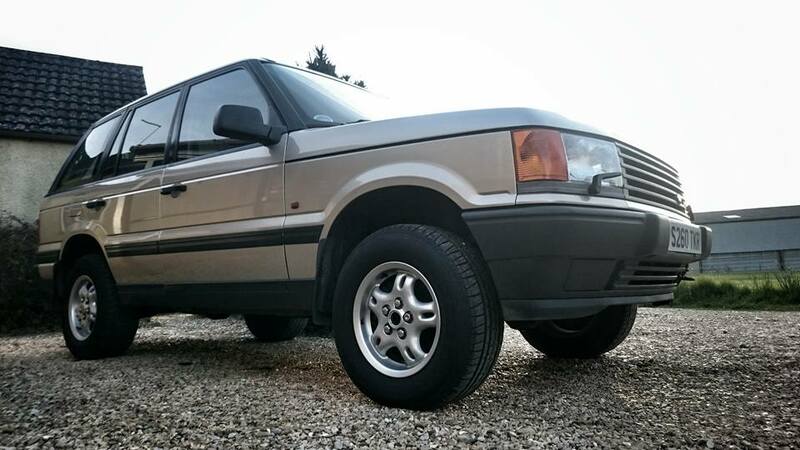 Some prices from the 1997 model catalogue shows just how costly and luxurious these Range Rovers could end up being. Prices for the interior trim options included £411.25 for lambswool carpet over-rugs, £763.75 for tinted security glass, £934.12 for the luxury trim pack, £1116.25 for rear seat picnic tables, £3225.37 for special leather seats with perforations and £3231,25 for the Deluxe wood veneer interior. The TV and Video system was listed as having a recommended retail price of £9341.25. 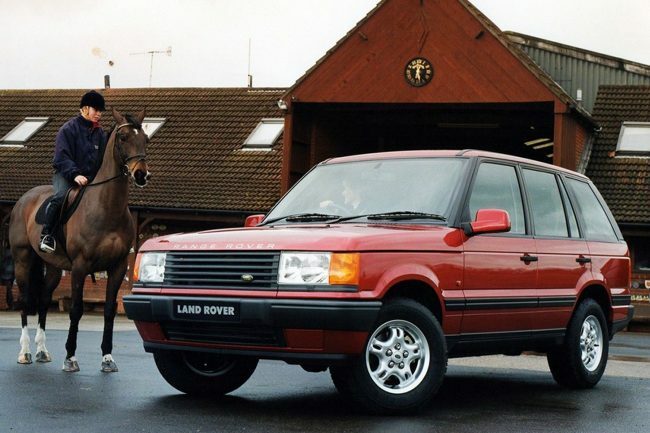 In September 1998, the Vogue SE model was added to the Range Rover, further enhancing its luxury appeal. Based on the 4.6 HSE and limited to 220 examples, the 4.6 Vogue SE featured elements of the Autobiography personalisation programme. 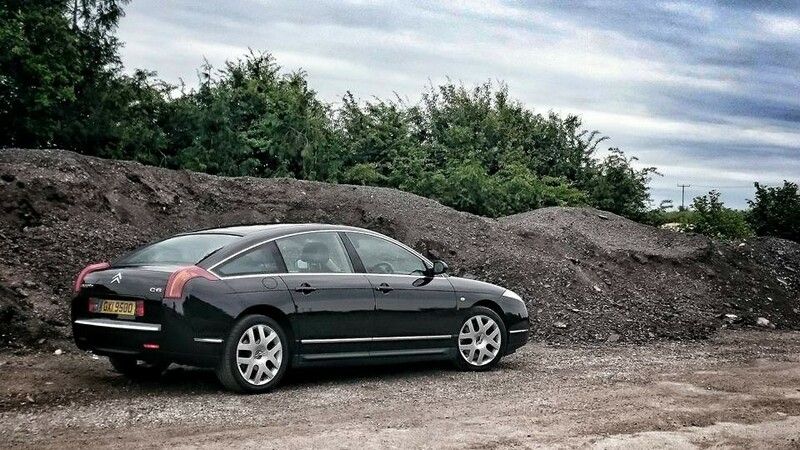 It wasn’t cheap at £53,750, but the 4.6 Vogue SE didn’t struggle to find keen buyers. Land Rover’s lesson learned was a simple one – the Range Rover was a premium product and owners were happy to pay to further personalise them. In December 1998, a second edition Vogue SE was launched. Limited to just 100 examples, this time the colour-coding influence linked the seat edge piping with the Lightstone main interior colour. The showroom price for this latest version was £54,495. Eight months later and there was a third edition of the 4.6 Vogue SE for the home market, again based on the range-topping 4.6 HSE, but limited to 150 examples. The Vogue SE lasted the rest of the P38A’s production run, receiving continuous updates, and further rises in price. It seemed as if buyers couldn’t get enough of costly Range Rovers. The last Vogue SE was launched in September 2001, and was limited to 300 examples. The price was £53,995 for the ‘standard’ 4.6 Vogue SE, rising to £57,995 when specified with the TV and DVD system. 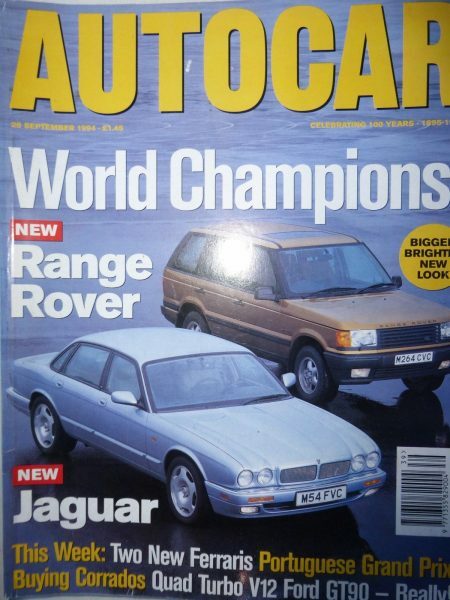 Clearly, P38A owners couldn’t get enough of more opulent Range Rovers and the Vogue SE nameplate. 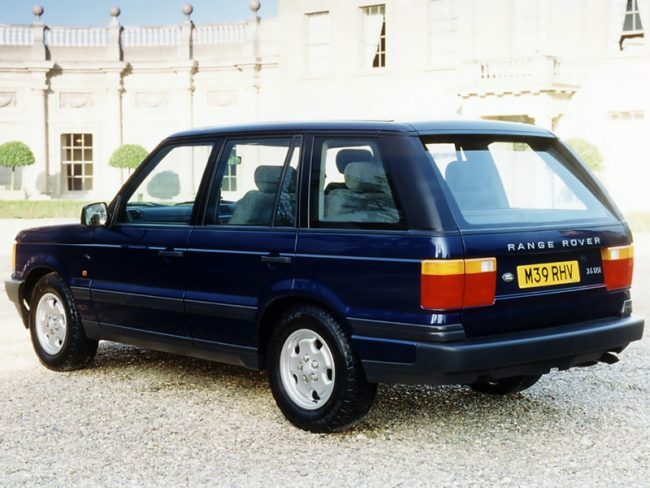 Conclusion: is the P38A a great Range Rover? Wolfgang Reitzle may be seen by many Rover fans as the embodiment of the Four Horsemen of the Apocalypse all rolled into one, but one thing he did understand was the value of the Range Rover – being as it was, the best in the world at what he did. And rather like Autocar, he came to the conclusion that, because of the way it was designed, it was not advanced enough to live a long life. One of his first decisions that affected Land Rover, was to abandon the Discovery replacement in favour of building a new Range Rover – which would owe nothing to the P38A. So, in concluding this, how can the P38A be summed up? It was an almighty car – and certainly deserved to be called the best off-roader in the world at the time of its launch, but one cannot help getting the feeling that it will always be remembered as the one that came between the original Range Rover and the pace-setting 2001 interpretation. It also ran up a reputation for horrendous unreliability in service, thanks to the flakiness of various cutting-edge electronics systems that had their first airing in this flagship car. 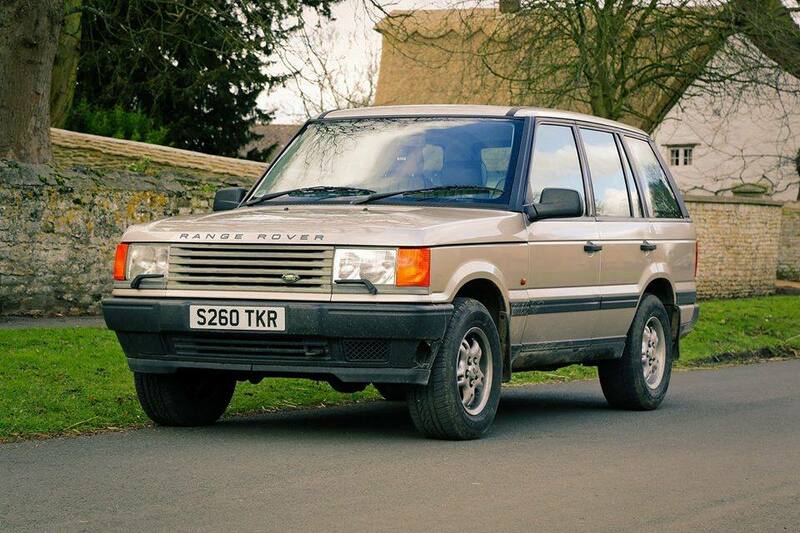 Being remembered in that way probably does not do justice to the P38A, which in the fullness of time has emerged as a good classic Range Rover, and one with far more on- and off-road ability than its legendary predecessor. We hope that it will be remembered as much on the merit of its abilities, too.